Time has proved beyond doubt that the human determination and endeavours has no limitations. Human beings are free to grow, learn and think. Hence, in all these spheres a visually impaired or blind person is definitely no exception and performs the same function being a part of the evolution of life. If the blind get the right encouragement and the active co-operation, then they could achieve anything they want. The lack of vision should not prevent him from doing anything. An alternative method and assisting devices could easily help him achieve his goal. With the advancement of technology, he may become independent in every stage and every aspect of life. He must strive for that. Independence is good but a blind does not want to be as an isolated island. Aristotle has said that the man is a social being. One of the main causes for man becoming a social being is `interdependence'. ( Helping each other ) Personally I consider society to be a web of interaction, through which it fulfils all its needs, personal social and otherwise. Therefore we can all agree that the blind form an integral part of world Community . Visual acuity not exceeding 6/60 or 20/200 (Snellen) in the better eye with correcting lenses. Limitation in the field of vision, subtending and angle of 20 degrees or worse. This category falls between totally and partially blind. The Death : It seems like the Blind man has no right to life. In Greece the blind were thrown of mountaintops. The Family : With the onset of the Biblical influence and Christianity, Families began to take total control and care for the blind but that gave them little access to the outside world. The Freedom : Here the blind got the freedom to attend religious ceremonies and live off the charity of the Church with help offered in the name of charity, but were encouraged to beg. The Institutionalisation : In this stage the blind were given a chance to gain education with an improvement in humanitarian treatment but unfortunately he was still segregated from society. Since the Blind may not be able to be institutionalized on a large scale, the need for social realization is strong. Even this system could not cater to all blind persons a strong need for society's participation in the care taking of the Blind is felt. Countries like Germany and the U.S.A. are strongly encouraging the ideal of the integration of the blind into normal society. How the people understand the blinds in general ? 1) Negligence : The sort of persons falling into this category are those that only sympathise the blind and are totally ignorant of their latent capabilities. 2) Miracle : If the blind are able to do anything the credit doesn't go to these capabilities but the notion of miraculous flowers is at once attached to it. 3) Actual understanding : Here the blind gets his due credit and empathy, his capabilities being duly acknowledged. 1) Doing social service is social status for the people (Giving fish to eat as he is hungry). Being his friend in social trauma (giving net and to teach how to catch the fish for his livelihood). 2) Then again the giving of charity to the blind is considered a deal worthy of blessing but giving a job to the blind is attached with the notion of an overall economic loss. 3) Helping the blind is considered a sacrifice while on the other hand the continual help toward the upliftment of the blind is attached with the notion of the blind needing spoon-feeding. I leave it up to you to eradicate these contradictions. Are you ready for the challenge ? As Hellen Keller rightly said that the problem does not lie with blindness but the attitude of society towards the blindness. To overcome these hurdles, in 1995, the Government of India passed the 'Persons with Disabilities (Equal opportunities, protection of rights and full participation) Act. According to this, Rehabilitation means the process aimed at enabling, person with disabilities to reach and maintain their optimal physical, sensory, intellectual, psychiatric and socio-functional level. Therefore it becomes the responsibility of one and all to extend and join hands towards this purpose and goal. The world is at the threshold of globalization, which in effect means everything coming under one global umbrella, where the slogan would be the contribution of all for the benefit and welfare of all. (Contribution of blind/sighted community for the benefit and welfare of blind and sighted community)The blind being an integral part of society, we cannot ignore and deprive them of their fundamental rights to lead a dignified life. It's a holistic approach where with the loss of one atom, the entire ecology crumbles. 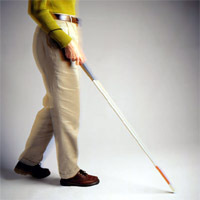 In conclusion, the full participation of the blind becomes very necessary. What we need to do here is foster the mutual spirit of co-operation among the blind and sighted community for the betterment of society. Total development of society cannot be achieved if the weaker sections are not developed as equally as other fellow citizens. Therefore have commitment for the integration of the blind !